Ever wonder what really happens after you leave the recycling center? Your old milk jugs, water bottles, detergent bottles, and other post-consumer waste can be cleaned and decontaminated, and saved from spending an eternity in your local landfill. These items then go through a compounding process to produce a high-density polyethylene (HDPE) rigid board stock material, that can be used like lumber! 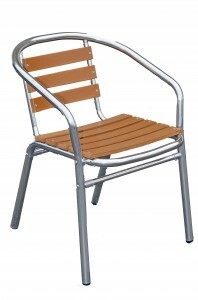 The plastic is then crafted to actually look like wood, giving it an aesthetic appeal for many outdoor furniture purposes. You may be wondering if this recycled plastic forms a weak or flimsy final product, but the truth is, polywood is a preferred alternative to traditional wood for commercial uses. With an expected lifespan of 50 years, polywood products are strong and durable. Compared to treated lumber, polywood is free from toxins and chemicals, which is safe to use and will not harm the soil surrounding the outdoor polywood furniture. Because it is a non-porous material, it will not harbor insects, mold, or fungi, and it is safe to use in beach-side areas near the saltwater of the ocean. You won’t need to waterproof the furniture, yet, it won’t warp or rot, because polywood will not absorb moisture. 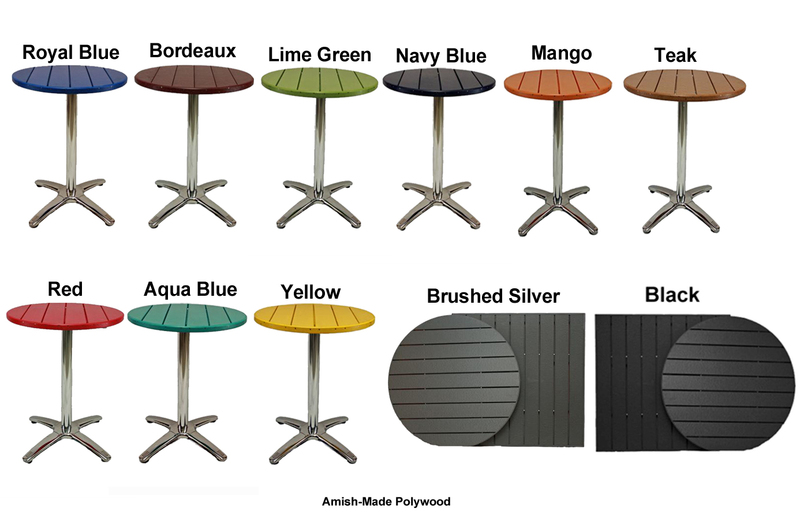 Your outdoor chairs and tables are also not limited to stains, as poly lumber is available in many exciting colors. The color is throughout (not just on the surface), so you will never need to repaint your polywood products. Nicks in the surface from everyday wear and tear will not be as easy to notice, since the color is throughout. This means the appearance of your outdoor furniture will stay beautiful for years to come! Want to add a bit of flair to your outdoor decor? Poly lumber comes in bright colors, such as lime or mango, but it is also available in more traditional colors, like black or brushed silver. Your polywood furniture can easily be cleaned with soap and water. It’s also tough enough to withstand a power washing. Besides an occasional cleaning, your poly lumber is practically maintenance free. Economically speaking, polywood is a great choice. Low prices, long lifetime, little upkeep – it makes dollar sense for you in every aspect. Polywoo d is a great choice for outdoor commercial properties, whether you are shopping for an outside dining area, hotel, resort, boardwalk vendor, or public beach. Built commercial grade strong, polywood furniture is also very attractive and will add a great look to your outdoor place! Because poly lumber is constructed with environmentally friendly materials without consuming natural resources, choosing polywood will help your “green” rating with a low eco-footprint. 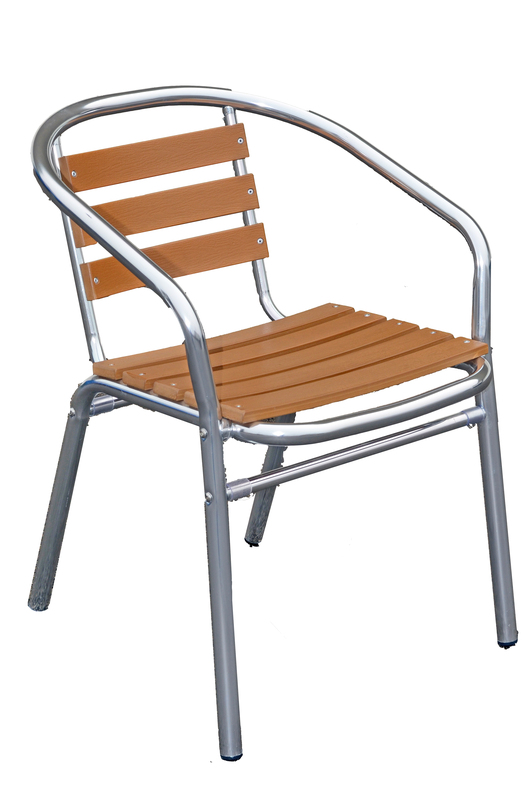 When the outdoor furniture has run its course, the items will be easy to recycle since they are constructed of recyclable materials. 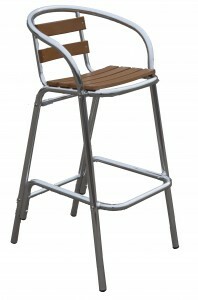 OutdoorRestaurantFurniture4Sale.com offers a wide variety of polywood products, from table tops to outdoor dining chairs. We also give our customers the choice of quality imported products, or outdoor furniture that is locally made in the U.S.A. by authentic Amish craftsmen. 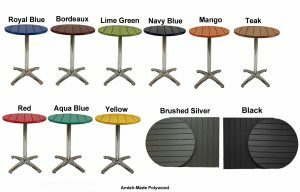 Any polywood product you choose will offer style, as well as sense-ability, to your outdoor commercial space!